We no longer offer this product, we have something even better to meet your needs.Find it here. Is R0 right for me? 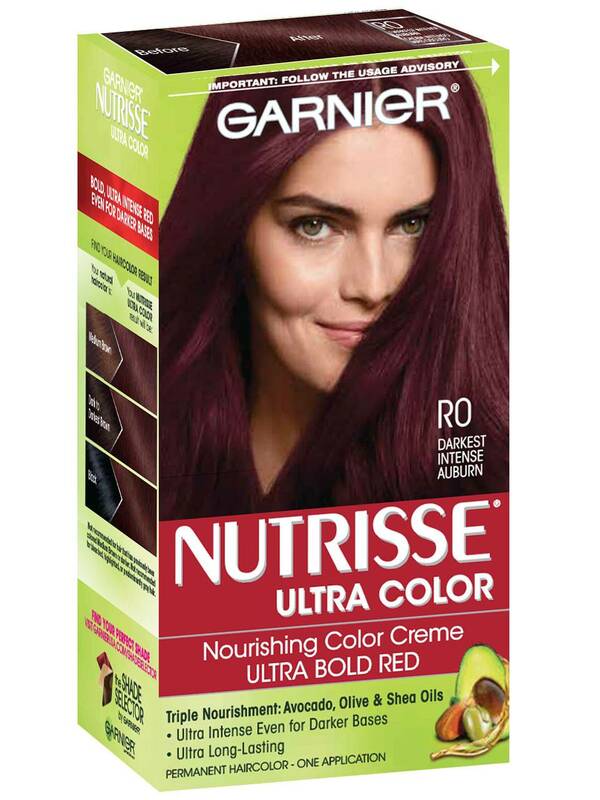 Garnier Nutrisse Ultra Color R0, "Deepest Intense Auburn," is the deepest of the three Ultra Color red shades and gives hair a strong red reflect. It is best for anyone with natural hair between medium brown and black. Explore our other two shades: R2 and R3. *For women with currently colored hair, there are special considerations for the color result you can achieve. Because of this, we do not recommend shade R0 for hair that has been previously bleached, highlighted, hair that is predominantly gray, or if you have previously colored your hair "Medium Brown" or darker. For more help, use our Shade Selector Tool to find the perfect shade for you! Rated 1 out of 5 by jordy324 from Thumbs down for this color! I am a self proclaimed "Garnier Girl" I have been dying my hair one of 2 Garnier colors for 7 years now! Woohoo! Everyone compliments my deep red color that only fades slightly over the month. I love this hair dye, I swear by it, my best friend uses it too. In the Summer I dye my hair with the R3 to get a lighter look and during the fall and winter I use the R1 Intense red color and it is my favorite ever. I am obsessed! This year, however, I was having trouble finding the R1 color in stores near me. Brookyln is difficult for toiletries so I completely understand but I took a chance on the new R0 color, it claims to be the darkest intense Auburn and I thought it would be close enough to give it a try. I am sad to report that I am disappointed with this hair color. It claims to have the same formula but I followed the instrtuctions EXACTLY as written and I have had 3 negative outcomes. First, my hair seems to be severely damaged, the hairs along my hair line and my part are all broken and about 1 inch tall and just sticking straight up, it broke off a LOT of my hair. Second, the color is not really intense red as it is described. Third, I've washed my hair about 3 or 4 times now and I have "hot roots" my roots are brassy, orangey and very light like they were bleached, not at all "dark" or "auburn". I want to go for the R1 but I am honestly afraid to put anything else on my hair right now like it will cause more damage. I just wanted to give feedback on this product that appears new to me. I still love you guys and I will continue to be a Garnier Girl but I will be avoiding this particular dye! Rated 1 out of 5 by Chargiar from Very dissatisfied! I always use Garnier Nutriese hair color because it's gentle and smells great. I used the color Darkest intense auburn expecting great results. But it did not turn out well at all! I have dark brown hair with a little grey, so I thought this would be perfect! After coloring my roots were reddish orange color!! Now I'm going to have to put my hair through another harsh treatment to get the results I want. Don't know which one to use. Very Disappointed! Rated 5 out of 5 by Boobabiesmom from Love this color! I am sorry to read this doesn't work for everyone but I love it! I have naturally mousey brown hair and wanted a dark red that complemented my skin tone. This color was perfect. It did not turn brassy for me as it did for others. It does lighten some over time and I do find I don't go much longer than 5 weeks between coloring. This is a wonderful color! Rated 1 out of 5 by jrb1028 from Did not work I had never dyed my hair before and decided to try R0 Darkest Intense Auburn, which is supposed to work well on undyed, medium to dark brown hair. I followed the instructions as written, waited about 35-40 minutes before rinsing and my hair looked no different than before, except my roots had turned slightly red. A waste of time, money and energy, and I am extremely disappointed that I added the effects of dyeing to my hair and did not even get a change in color. Rated 5 out of 5 by Starshine from Works for me , so I love it! In order for hair dye to work properly it is ideal to follow instructions. I have used this for several months now and I know that if I am going to have this dye work for me it is better to use two bottles especially if you have long hair and thick hair. I have no issues with my hair dye rubbing off from my hair to my fingers because the instructions state to wash until you no longer see hair dye washing off your hair. This product works, just follow the instructions. Rated 1 out of 5 by AGregory from I loved the color my hair turned out but after washing my hair multiple times the color continued rubbed off on my hand,face and shirts. Rated 5 out of 5 by alexisdiana from I honestly LOVE my hair! This is the best color that I've ever used and it is soooo perfect for me! If you have relatively tan skin then this color will shine on you.